After working in the consumer electronics industry with Panasonic in a managerial position, Jamie started his boat sales career working for a leading boat dealer, selling new and used Dufour Yachts. Jamie was also the UK specialist for the Austrian built Sunbeam Yachts from Scheochl Yachtbau. In addition to sales, Jamie has also delivered, commissioned and completed handovers to customers in France, Italy, Slovenia and Croatia. Before returning to the world of brokerage, Jamie ran a successful boat repair and refinishing business on the river Dart near Dartmouth. 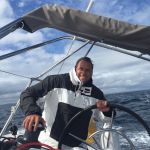 Outside of the office, for many years Jamie has enjoyed racing across the globe with a professional sailing yacht racing team, competing at a high level against Olympic and America’s Cup Sailors in one-design keelboat classes throughout Europe & USA. In June 2011, Jamie joined the ranks of Sunseeker Torquay and sister brokerage company One Brokerage, as Sales Broker. With all of his past experience, it is no surprise that Jamie has become the Sunseeker London Group’s sailing expert, providing assistance and valuations across the Group in addition to his usual new and used motor yacht sales.